Malachy Bodhrán (Kearns) and Roundstone Musical Instruments have received many recommendations from all around the world. Des Kenny of Kenny's Bookshop Reviews of the Book Wallup! THE IRISH TIMES ON THE WEB,17th of July 1997 "The Pulse of Irish Music"
Frommers 96 , "a favorite stop in Connemara"
Did you know that Christy Moore plays bodhráns made by Malachy Kearns? Did you know that Malachy Kearns made the bodhráns for Riverdance ? Malachy Kearns of Roundstone Musical Instruments (Tel: 095-35875) and Fax:095 359800, works in the ancient Franciscian monastery IDA Craft Centre in Roundstone. The bell tower and outer walls of this 16th century monks home and local school are still there, and in the summer seals and dolphins gather at its outer walls near the workshop .Malachy is a master craftsman, and the only full time bodhrán maker in the World. The Bodhrán is an ancient Irish one-sided frame drum, and for the best results, it is vital to have the quality goatskin Malachy uses. While you wait his wife ,Anne, a Celtic Artist, can decorate the skin with Celtic designs, initials family crests or any design you request in old Gaelic script Malachy's workshop also makes wooden flutes(ebony), tin whistles, and harps, and he has an excellent mail order service. The workshop/craft shop and Folk museum are open daily from May to October from 8.so to 6.30pm, Monday through Friday other months. This is one of my personal favorite stops in Connemara. The Kearns also have a shop on the Mail Street in Clifden (Tel: 095 21516), open daily from 9am to 7pm from April through to October, Monday through Saturday in winter. AN EXTRACT TAKEN FROM "Ireland's Traditional Crafts." David Shaw-Smith, Thames and Hudson. 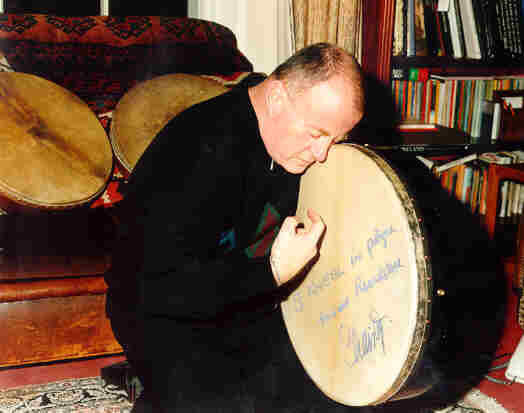 The origin of the frame drum known as the bodhrán is obscure. It is thought to date from pagan times, but in more recent years it has become associated with the 'wren boys an old custom where by on St. Stephen's Day a wren is captured and paraded from house to house, accompanied by music. Malachy Kearns, who lives and works in Roundstone, Co. Galway, is respected as a fine bodhrán maker. The most favoured and common skins he uses are goat and deer; greyhound and donkey hides are also good. The skins are cured in hydrated lime mixed with ingredients that are the close secret of every bodhrán maker; cured thus, they will keep indefinitely. They are then soaked for seven to ten days in a solution of lime sulphide, which softens the skin and partially dissolves the fatty tissue so that fat acid hair can be easily removed with a scraper. After the skin has been stretched on a frame for two to three days and scraped further, a portion of it is removed and tacked under tension onto the beech wood frame of the bodhrán using brass upholstery nails. As an added precaution it is also glued. Next the cross-pieces are fitted. The beater can be turned from holly, oak, beech and even larch. In the hands of a skilled player it can be a subtle and exciting instrument. The skin is struck in a variety of ways, even using the heel of the hand and fingers, the hand support the instrument tucked in behind the cross piece, varies the colour and intensity of the sound pressing oil the skin. The side of 'the beater is also used to good effect on the wooden rim.